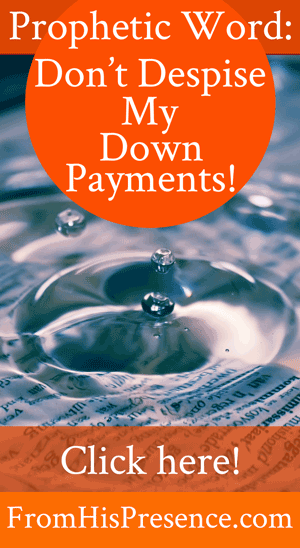 Prophetic Word: Don’t Despise My Down Payments! The Lord showed me that many of you have received a promise–or had a promise reconfirmed–recently. God has spoken to many of you about blessings, healing, favor, and more. However, you’ve been through such a hard time over the last few years that you’ve adopted a “wait and see” attitude. You haven’t really been able to latch on to His blessings and promises in faith. But then He showed me that He has sent many of you a sign of land. He has been doing little things–showing you small manifestations–that are the tip of the iceberg on the big promise. The Lord is pouring out the manifestation of His promises. He is working to bring you favor, healing, restoration, blessings, provision, and more. … You must grab onto His down payments by faith. He is showing you a little bit of favor. It’s not all He promised you, but it’s more than you had yesterday. He is strengthening you. You don’t feel as strong as you need to feel, but you’re stronger than you were last month. He’s opening doors for you. You may only see a little door, but it’s better than the “no doors” you saw yesterday. These little blessings are down payments on Father’s promises. They are signs of the new season of blessing you are in. Will you receive them and give thanks? Will you acknowledge Him and bless His name for these small things He is doing for you? Will you latch onto His promises in faith, believing that the small things you see are a sign of land–a down payment on all the good things to come? This is a test. It is a test that will reveal whether or not you will be a believing believer. No matter what you’ve been through, God is faithful. He always has been, and He always will be. You have come out from the fire stronger than ever before. Much dross has been burned away from your life. And now the test will require you to decide that, no matter what, you will continue to stand in faith on God’s Word. If God said it, it’s going to happen. The blessings Father promised you WILL come to fruition. Will you stand and boldly declare, “Let God be true and every man a liar”? Will you give thanks in advance for the completion of Father’s promises, even when you only see His down payment right now? Will you believe the prophets, believe God’s promises, and–most importantly–believe that He is good, and His mercy toward you endures forever? Like it says in Psalm 86:17, Father is showing you signs for good. How will you respond? Did Holy Spirit use this word to minister to your heart today? If so, leave a comment below! And feel free to pray for one another and encourage one another in the comments! Thank you for making me aware of my wait and see attitude. Blessings! Your prophetic words speaks truth….. It indeed ministered to the circumstances in my life. I receive all the promises and privileges of the Kingdom that God has promised me by faith in Jesus name. I also declare that let every man be a liar and God be true in Jesus name. Yes, I will give thanks! So good!!! Hallelujah I decree and declare in Jesus mighty name let God be true and every man a liar, in Jesus name. Amen. Indeed, these words are for me.. I now have the consciousness that I need to give thanks to God thus far for the little I get. Indeed I am much better today than was yesterday. My expectations for a better tomorrow is rekindled because of the assurance in God’s words. Yes I will always give thanks to God. I thank you God for the whispers of your blessings in my life. I am in anticipation for more. Let God be true and every man a liar. Wow, this word is so on time .Thank you Father for your down payments on your promises to me, you are so awesome and I bless you. I love you Lord. You really do keep your promises to us, Glory be to Jesus#feelingsoloved? I prayed for a sign, and then first thing this morning I read your email. This is my answer! I too have been receiving down payments and was disappointed because they weren’t what I have been praying for. Now i know my blessing is on its way! Thank You! As always right on time word…AMEN! Thank you so much! This word is awesome. My prayer is God continue to show favor to his children. I pray for God’s blessing and favor for Jamie’s household. Hi, this is a timely word, and confirmation of the season I’m in . I was blessed by this prophetic word sent to my email. Thank you for your obedience to God the Holy Spirit. This is for me. Thank you Jamie! Jamie, I really thank you for this word today. God knows what I needed to hear today. You are a living Angel. This word made me feel so much better. I am just going to on Praising Him. May God continually bless you and your family and ministry. Thank you for these words they are so true! After praying the other day and God say, “Be anxious for nothing!” Then today as I was writing prophetic poems to prophetic music God flashed the number 16 to me and He flashed it several times! I have asked Him what it meant, he hasn’t answered me yet! I feel so much joy down deep in my soul! Thank you Lord! I will stand, I will give thanks for every sign, I will trust You, because I believe and love You! Thanks Jamie! Oh yes, what a word ; I felt as though you were writing just to ME . I have been without a car since January . A wonderful sister miraculously was used last Wed to give me a very nice car ? . Ironically her car was parked in Jan as she was told it needed a transmission . That turned out not to be true, but she bought a new one the next day . What a sweet down payment on the promise that I have been believing for. Outpouring of blessings to you ??? Amen! I am thankful for the down payments and acknowledge the confirmation and signs of His promises . Let God be true and every man (and enemy) a liar! Standing strong for He who promised is faithful! Thank you Jamie! I prayed for confirmation message and this is it! Thank you Lord for reminding me of the small things you have used to remind me that I can and will continue to stand on the promises You have given me and I will continue to recognize it was You who told me I would receive this promise! You don’t allow Your words to go out and return to You void and not accomplish ALL You say! Thank you for reminding me, Father God, with the small things until you bring my breakthrough into fruition! Hallelujah! My faithful Abba…I see You! You’re just cracking it open! This is the cloud, the size of a man’s hand. I hear the sound of an abundance of rain! And the first few drops will mix with my tears of joy as I lift my face to You in confident expectation. I will stop everthing and build an altar of worship. You’re so worthy! How I adore You! Perfect timing and word ! I am in Jamie! God is good! I boldly declare, “Let God be true and every man a liar”! I will also give thanks in advance for the completion of my Father’s promises. Thank you Lord Jesus! Amen! I have been through a lot and i pray that my heart is open to believing as I let go of the pains of the past. I know that God has already made down payments. Thanks be to God for His word in season and God bless you Jamie for allowing yourself to be the instrument that He uses! Jamie I told you that my family and I are homeless and have been living in a motel. Well my credit was repaired well enuff to purchase a home thru the V.A. I was in the Marines! My payment is going to be almost equel to what I’m paying at the Motel by $100- $300. I feel your word is for me and I am going to accept the deal. What do you feel in your spirit? God bless you abundantly my sister in Christ. Thank God for your life Jamie. The message has come at the right time. I am encouraged. Amen, Jamie. This Word is lovely and true. Thank you for speaking wisdom and encouragement. I am currently trapped in a career that my mother egged me into whenever I was at a gullible stage easily confused and then she walked away when I tried to get advice from her that it might be wrong. I told her I would ask my physics teacher for advice and my mother said “he’ll tell you no to do it and to do whatever you want why wouldn’t he”. I have spent 22 years with her stone around my neck wishing to God that I had gone and talked to m physics teacher. I now pray and ask for an outstanding miracle that the door be opened for me to branch well out of my current career to one that is not a stone around my neck and not me. I could hav done anything. My mother sabotaged and groomed me to do what she wanted for herself from I was 13. May God be shown to outsmart my mother. Let my mother wear my shoes if she wants to achieve them. She hasn’t any right to use me for achieving anything. May God be true and my mother a liar and give me back my true self. Amen and Amen, Let God be true and every man a liar.. i have recieved the blessings and his promises have come to fruition in my life and that of my family and i know that i know ..his Grace and mercy will continue to cover Us . I bless anyone reading this and i thank God for everything he has done for everyone else in their individual capacities. Thank you for the word. you are such a blessing. Glory to God. Your prophetic word has resignation with my spirit. I am in the process of having a home built next to our current lot. We’ve owned this lot for several years now and have always desired to build on it OR tear down our current home which is being overrun by rats and flying cockroaches. I stay up pretty late to avoid going to bed in fear that they run over my ed. I don’t get much quality sleep because of this fear. My husband and I have retired from our current jobs (me, due to health issues and him being retired about 2 years). We’ve always planned on using our retirement for our down payment on the house because we sincerely can’t afford a large house note and the amount of years it would take to pay it off. I’ve been asking the Lord to give me a sign that this was His will. My earthly husband has been on me for months and months to start the process of home ownership. Until today, June 7, 2017, I had not spoken to a loan specialist. For some reason, (GOD) I had a burst of energy beyond my understanding, I started applying for loans. Our credit rating isn’t good,(675). I took care of finding out about some serious deductions that were being taking out of our accounts. These deductions are over many years. I’ve ever looked into them after being told to do so many years before. This surge of wisdom came over me from Heaven. I have been diagnosed as having dementia since last year. Our oldest son had to take over handling our finances because of it. I’m telling you and the world that GOD had control Today. He took control of my mouth and allowed me to answer questions that I was even surprised to know the answers to. “DOWN PAYMENT ” was my prophetic word. I didn’t know you had sent this email about “DOWN PAYMENT ” until late tonight. I give Him Praise, Honor and Glory and I pray that the rushing of His blessings be on your life tonight. Thank you for coming into my life when all hope was loss. Please continue to be a blessing for those who have loss strength, hope and courage. Moved by what you shared, Johnnie. Celebrating His down payment in your life, even in giving you energy to exert effort after all that you’ve endured. Coming into agreement with you in faith for His divine turn around (Esther style) and for you to lay hold to the full measure of His restoration in your life; for you to see His goodness right here in the land of the living! In Jesus’ name, it is so. Amen. I totally receive and accept this ABBA YAH, as well as repent and ask for forgiveness for devaluing Your beginning down payments! Bless Your Heart Precious One! Amen and Amen! My husband has had both knees replaced and now his hip replaced after 30+ yrs in the coal mines. He has been turned down for disability twice, so I have worked all I can to support us. We sold our home and bought a much smaller, cheaper home. This past week, one day before having his hip replaced and after almost 2 yrs of waiting, he received a settlement from the mines he worked at. (They decided in his favor, we receive in 60-90 days. ) While sitting in the mediating room, waiting on judgement of his case, he received a call of approval for his disability, including 15 mos back pay! All in Gods timing! Praise God from whom all blessings flow! Just wanted to share in case any of y’all are waiting on God, keep believing, never give up! God is good, and He never fails in His promises! Jamie, I am just now reading this (several days after you posted it) but it was right when I needed it. God is so good! I have been struggling with my stand on healing and financial breakthrough and Abba spoke through you. God is so good – He always knows what I need and this just blessed my socks off! Hi Jamie thanks a bunch,it’s rite from above I’ve learnt to put recognition on what seems to be alittle bit of God’s promises to me and continue in thanks for greater ones yet to come.